Our product range includes a wide range of polyester bag closing thread. We are one of the conspicuous names in the industry for the inclusive range of Polyester Bag Closing Thread for our valuable customers. These are used for bag stitching. Used top grades material and advanced tools to design the entire range of products. 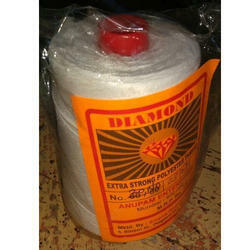 Apart from this, we are offering this polyester bag closing thread at leading market rates. Looking for Polyester Bag Closing Threads ?